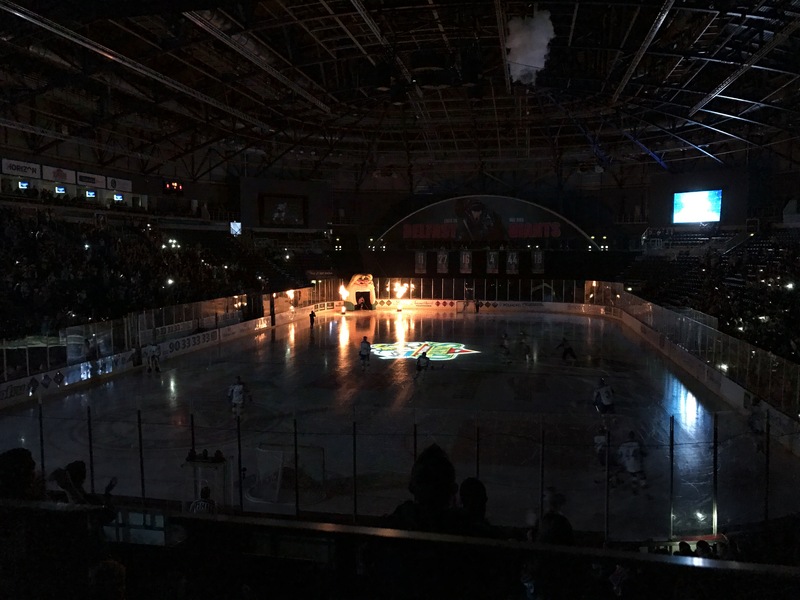 Hello everyone and welcome to another Belfast Giants/hockey post. 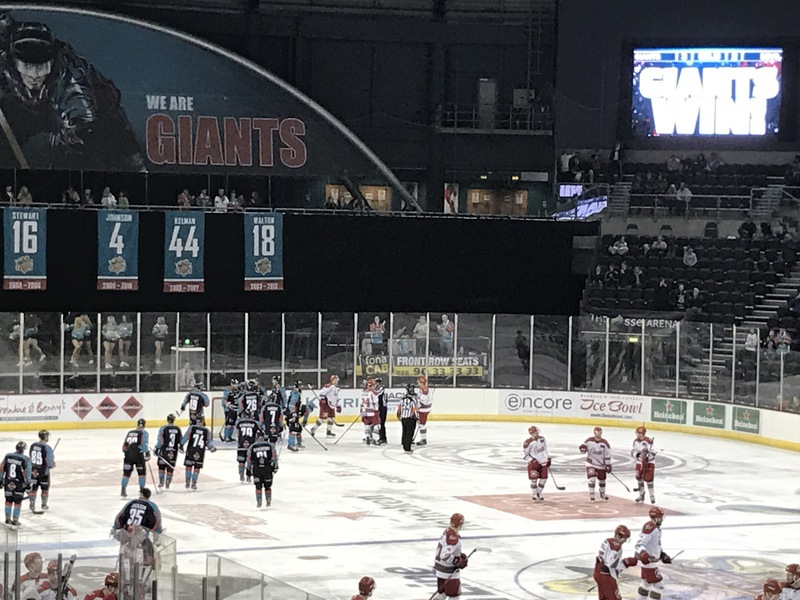 This weekend was to be a long one for the Giants with two home games on Friday and Saturday against the current top two teams in the league and an away game on Sunday against Edinburgh for the Challenge Cup. Firstly, Friday brought Fife Flyers. They were not to be seen as an easy competitor, they have made their way to second place in the league. With Giants currently trying to get the points to catch up with the top team, Cardiff Devils, both these games were essential and on home ice, a good opportunity to take the four points. Almost 5 minutes into the first period (4:44), Blair Riley opened the scoring to bring the Giants 1-0 up. This was followed at 16:24 by Colin Shields to give the Giants a 2-0 lead going in to the second period. 2-0 leads have been known to be the most dangerous leads in hockey, a lot of them being turned around easily when a team thinks they’re a bit safer. The second period didn’t really bring much, Flyers were better defensively and shut the Giants out a bit more. The third period brought two more goals, one at 4:11 from Brandon Benedict, an absolute beauty of a goal whilst we were short handed (meaning we had 4 guys whilst Flyers had 5, not counting the netminders). At 8 minutes 29 seconds, Ryan Martinelli scored to bring the Giants 4-0 up which would be the last goal of the game, bringing it to an awesome 4-0 defeat from the Giants and a shut-out for out netminder Stephen Murphy. Around 15 minutes in to the third period, Moyer of the Flyers threw a pretty dirty check at Adam Keefe. This didn’t sit well with Keefe who tried to fight, but Moyer was having none of it. This resulted in both Moyer and Keefe being ejected from the game. Blair Riley got man of the match and I think he deserved it, he played brilliantly. Stephen Murphy could have gotten it just as easily. Honestly, it was a hard game to call with most of the players really throwing in a team effort. Murphy played absolutely phenomenally, and I found all the players seemed to bring it back to basics. Their passes were working, they were gelling and the attitude just seemed so much better. It gave me a lot more confidence going in to the Cardiff game on Saturday which was to be our biggest challenge so far. Saturday brought the Cardiff Devils, a team who are currently first in the league standings. The Giants have met them twice so far and unfortunately come out the bottom team both times. With the momentum from a 4-0 win on Friday, the Giants were entering on good energy. However, the Devils hadn’t played the night before and had fresh legs, whereas we were more tired. Giants opened the scoring in the first period at 13:26 with a goal from Chris Higgins, first thought to be from Derrick Walser. This brought some more momentum to the game and led to a second goal in the second period from Walser at 7:30. This was the result of a 1 on 1 breakaway and was an absolutely fantastic goal from the player coach. Devils pulled it back after a goal at 14:31 and another again at 17:59 after taking a bit of energy from their first goal. The second period ended with the Giants and the Devils level at 2-2 making the 3rd period crucial for both teams. Just 32 seconds into the third period, an amazing shot from Walser gave the Giants a 3-2 lead. I honestly had to rewatch this one on highlights as it was so fast I nearly missed it! A lot of the third period was then the Giants trying to protect their one goal lead. Devils pulled their netminder with around 1 minutes (I think) to go and gained a 6th player. This was the longest and most nervewracking minute of my life with a few quite close calls! The buzzer went and the Giants took their 3-2 victory and another two points. A vital two points leaving 6 points between us and the Devils with two games in hand on them. Man of the match was given (very deservingly) to Derrick Walser. He played a phenomenal game and definitely helped the Giants into their victory against the Devils. Again, I really think this was a team effort and another phenomenal game from Murphy. Sunday was a Challenge Cup game against Edinburgh Capitals. With the Giants already at the top of their Challenge Cup group, it was somewhat a ‘dead rubber’ game, meaning much more for Capitals than it did for us. Andrew Dickson started in net, getting his first start of the season so far and allowing Murphy a well earned break after an absolute cracker of a weekend from him. The Giants would be understandably tired after playing 3 games in as many days and travelling to Edinburgh, but that wasn’t to take their energy. I wasn’t at this game so I can’t comment on the play, but the Giants took an early lead at 2:04 from David Rutherford, closely followed by Capitals 16 seconds later to equalise. Michael Quesnele scored again to give the giants a 2-1 lead at 18:33 ending the first period. The second period opened again just 2 mins 36seconds in with a goal from Steve Saviano. The Giants took several penalties it seems this period, and it lead to a powerplay goal from the Capitals at 5 minutes in. James Desmarais reinstated the two goal lead at 8:09 into the second period. It was Desmarais again in the third period who opened the scoring at 4:28 and Boxill who followed up at 12:05 to bring the Giants to a 6-2 lead and a win for Andrew Dickson, his first time appearing in the net for Giants this season. From what I can see result wise, the Giants played amazingly for a team that has played 180 minutes of hockey over the weekend. An absolute amazing weekend to bring 6 points out of a possible 6! 4 points in the league and 2 points in the challenge cup. As far as I’m aware Desmaris took man of the match for Sunday nights game, getting two goals and an assist, well deserved. Absolutely fantastic weekend from the boys in teal, couldn’t have asked for more. We’ve really seen the potential in this team! There’s no home games now until 10th December due to some other events happening in the Odyssey, but the Giants will be on the road, their next game on Saturday against Dundee. The weekend gave us 13 goals and we conceded 4, not a bad result at all. That’s it from me guys, any questions give me a buzz!